* The iPad mini case must provide a significant amount of impact and compression protection. * The iPad mini case must be able to withstand a 6-foot drop to concrete with no damage to the iPad mini. * Any added protection to the iPad mini case, such as an IP-rating, meeting military standards, a built-in screen protector and/or port covers are extra bonuses I take into consideration. 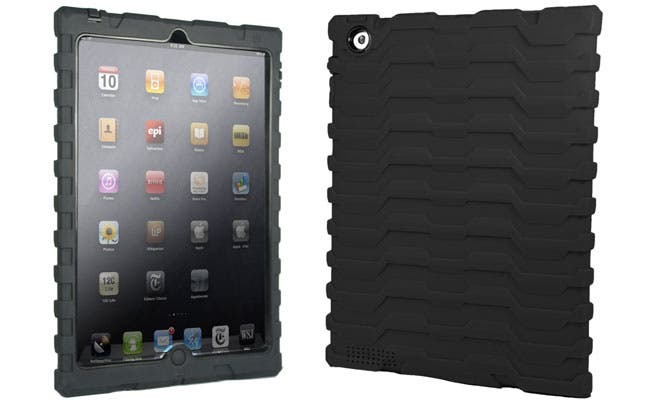 The Defender is one of the most popular rugged iPad mini cases out there. And with good reason! 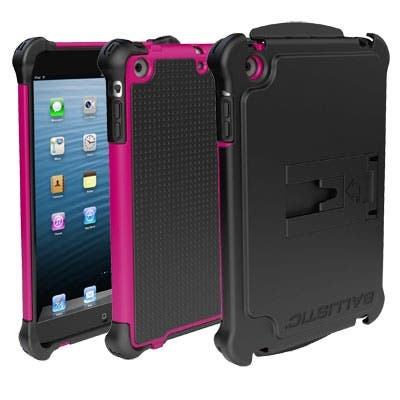 This Otterbox iPad case can take a beating while keeping your iPad mini safe and sound within its protective embrace. The Defender has a shatter-resistant, hard inner skeleton with an extremely resilient, tear-proof, rubber outer skin. It also comes with a useful dual-purpose, snap-on cover panel. When you're not using the mini, or are toting it around in a bag, the cover clips securely to the front of the device, providing total front screen protection. When your iPad mini is in use, the cover panel can either clip on to the device’s back or convert to an iPad stand for convenient viewing and typing. Otterbox is no stranger to creating some of the world’s best and most versatile iDevice cases, and continuing its tradition of reliability and excellence, the Otterbox Defender iPad mini case certainly shines as a favorite for the iPad mini. The Survivor iPad mini case is built tough and with integrity like a military tank or Hummer vehicle. The Survivor is far and away one of the best protective iPad mini cases on the market. Griffin built this gladiator of iPad cases with great consideration to the stresses an active or outdoor lifestyle can subject an iPad mini to. In fact, of all the cases I included, Griffin's Survivor provides the best, most thorough protective seal from any intrusion of debris, including water, dust, sand, mud, etc. It has cover flaps over the headphone jack, microphone, camera, and charging port. It also sports a unique feature; a thin, water-resistant membrane covering the speakers, offering protection unlike anything else currently on the market. The Survivor also comes with a tiny, unobtrusive clip-on stand that allows you to use the iPad mini in landscape mode. When not in use, it snaps discreetly onto the side of the mini. If you're looking for a heavy-duty iPad case that is adventure-ready and able to handle whatever you throw at it, this military-standard titan might be just what you need. The Tough Jacket iPad mini case is designed to withstand some serious impact. It has a shock absorbing inner silicone layer, which slips into a rigid polycarbonate exoskeleton, combining to deliver a high level of security for your relatively delicate iPad mini. As an added level of protection, the Tough Jacket comes with a sturdy front screen cover, which snaps on over the iPad’s touchscreen, keeping it safe when not in use, traveling, or carrying it in your backpack. When you are ready to use your iPad, you can snap the cover panel onto the back of the device, or use it as a stand, propping your iPad mini in landscape mode. This case is designed primarily with impact protection in mind, and does not have port covers built-in; therefore I wouldn't suggest it for extreme outdoor use. It’s not designed to keep debris away from the iPad’s internal electronics. If it got wet or fell in the mud or sand, it would be too easy for debris to enter your iPad through the exposed openings. The ShockDrop iPad mini case often goes on sale on Amazon, making it the the most affordable of the rugged cases featured here. With its extra grippy traction it reminds me of a tractor's tread, allowing for a secure grip as well as a high level of shock absorption. The screen protector keeps your iPad mini’s touchscreen safe from scratches and cracks. It has tear-resistant rubber flaps, which snugly and securely seal the main port openings of the headphone jack and charging port. This case definitely provides well-rounded protection from most of the drops and shocks that go along with the day-to-day rigors of an active lifestyle. If you are looking for one of the more affordable, rugged iPad mini cases that can handle some rigorous hardships, be sure to check this one out!